And if you're going to be a Miss Judgey McJudgey Pants, well... keep reading! Because if you're yet to discover the art of the pre travel download, listen up: this advice is life changing. My whole fam has a device, some more than one (leave that judgement at the door.... la la la la la la la... not listening!) and before we go away we load up on the good stuff, i.e., smash that home wifi by downloading alllll the shows we love, which is perfect for car travel, and proved to be fantastic during our mini break at a cabin at Shelly Beach, where there was no wifi to speak of (well, the signal was so weak it may as well have been non existent). Add some noise cancelling headphones so you don't have to listen to anyone else's show (like the ones the generous folks from Netflix Australia/New Zealand Josie's Juice as a proud 'Steamteam Blogger' member - see below), some snacks (I am actually, legit called the snack queen when I go away with my friends), and you are in zone out heaven. Think about it: long drive, all those "Are we there yet?" 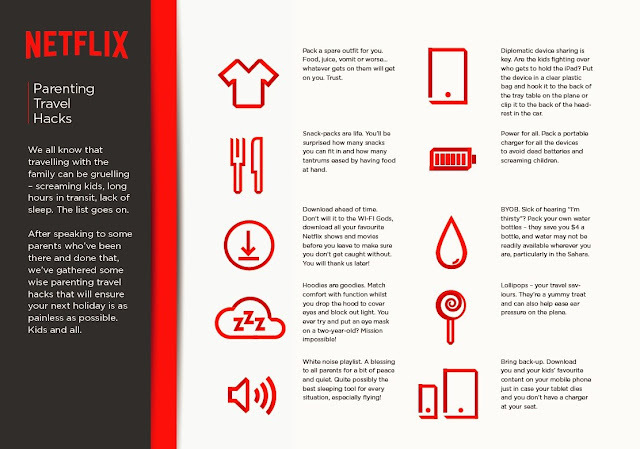 questions, NO Wifi, NO 'personal hotspot' to speak of, and... AH, look at that: your little ones' (and big ones') iPad are loaded up with all their fave 'Netflix Originals' shows, classic movies, and so much more. Everyone is quiet, everyone is happy. Now, we don't advocate no family chatter at all when you all go away. But sometimes, sanity prevails when that time out from each other is needed, and you want to zone out in front of a screen. We've ALL done it, and it's kinda what makes you actually FEEL like you're on holidays. For my daughter, it's all about 'Haters Back Off' and revisiting 'Total Drama Island', and movies like 'The Cat In The Hat'. For my son, he likes to revisit the classics: 'Thomas And Friends' is still his fave, and his choices are almost endless via the kiddie movie selection. Follow the conversation and see what all the other Netflix Streamteam Bloggers are up to and their viewing choices. See #StreamTeamANZ - and see the handy guide below! Make downloading Netflix part of your packing process prior to travel.